Eating Watercress is Anti-Ageing, an Aphrodisiac, a cure for Hangovers, and much more! If you want to roll back the years, forget expensive creams and lotions! A recent study shows that adding one bag of watercress a day to your diet can improve your skin tone and reduce wrinkles! In the new study, 10 out of 11 female volunteers experienced visible improvements to their skin after just four weeks of adding one bag of watercress a day to their diet. One woman even managed to reduce her facial wrinkles by an incredible 39 per cent! Incredible, right? The majority of women also reported increased energy levels. During the trial, the volunteers made no other changes to their usual health and beauty regime. They were allowed to eat their daily quota of watercress in any way they chose – in salads, sandwiches, whizzed into smoothies or wilted into pasta, however it was not allowed to be cooked, only to be consumed fresh. Watercress usually grows along the banks of slow-running streams and rivers in Europe, Asia and America. It is characterized by its small, round leaves, with a pungent, peppery flavor. The small white flowers appear in flat clusters are called corymbs. The fresh, tender leaves of watercress have to be harvested just before flowering, because after flowering they become bitter and are no longer good to eat. The health benefits of watercress have been known since ancient days, when it was used as an aphrodisiac by royalty. Watercress has plenty of health and therapeutic properties. However, due to its strong, pungent and bitter taste, it is never used alone, but is always added to juices, salads or other dishes as an ingredient, flavor or garnish. Anti-anaemic Effect: Watercress is particularly helpful in treating different types of anemia due to its high content in iron. Iron is essential for the synthesis of hemoglobin, and folic acid, which plays a key role in the maturation of red cells in the bone marrow. The right amount of vitamin C in watercress also makes better absorption of iron. DNA, preserve: In a laboratory test, it was found that daily consumption of watercress increase the ability of cells to resist DNA damages to lymphocytes (white blood cells). Teeth: Chewing watercress makes teeth stronger. It also cures bleeding of the gum or gingivitis. Thyroid Gland: The high iodine content in watercress can help prevent goiter, improve the function of the thyroid gland and relieve the symptoms of many forms of hypothyroidism. Categories: Beauty, Did You Know?, Eat Green, Eco Living, Live Green, Natural Mantra, Organic Living, Sustainable Living | Tags: Anti-Ageing, Anti-Cancer, Aphrodisiac, beauty, face, green, Hangovers, Natural Mantra, skin, Watercress, Wrinkles | Permalink. What is Argan Oil and why is it such a popular beauty trend worldwide? What is Argan Oil? Argan Oil is pressed from the nut of the fruit of the Argan Tree, which is only found in the semi-desert area of South- Western Morocco. The argan tree lives to be about 150 to 200 years old and does not start producing the fruit, which is smaller than apricots, until it is 30 to 50 years old. Because the tree is found only in a limited area, the oil itself is quite rare. Argan Oil is not made from a nut at all. Argania spinosa trees are fruit bearing, and Argan Oil is made from the kernel inside of the pit of the fruit. So this product is nut-free. The extraction of the oil from that kernel inside the fruit is done by hand is very time consuming. The fruit of the Argan tree is green in early spring and then turns gold and falls from the tree. At that point it is then picked up and opened. The outer layer of fruit is often given to local goats to enjoy and the pits are taken from the inside of the fruit. These pits are then allowed to dry in the marvelous Moroccan sun. Then the hard work begins. Each pit is cracked between two stones. The kernels are then removed, crushed in a mortar with a pestle, and then ground into a thick paste by hand with a stone quern. The paste is then squeezed to produce the oil. The solid part of the paste is used as animal feed or a type of soap. Argan Oil for Culinary Use: One is for culinary purposes and the other is for cosmetic use. If the oil is to be used in cuisine, the kernels are roasted before grinding. This brings out the delicious nutty flavour in the oil. Roasted kernels produce a lot more oil than unroasted kernels. This is why culinary Argan Oil is less expensive than cosmetic version. Argan Oil for Cosmetic Use: This is made from raw, unfrosted pits. It, too, has a bit of a green, nutty aroma when you first apply it, but that scent completely disappears within a few minutes. Beware of “deodorized” Argan Oil. The process used to take the aroma out of the oil is said to damage the miraculous abilities of pure, unaltered Argan Oil. What do Goats Have to Do With it? Morocco’s mountain goat, called the Tamri goat, eats the fruit of the Argan tree. The goats literally climb the tree to get to the nut. Goats find this fruit so delicious they are willing to climb the prickly Argan trees to get at it, sometimes even ten goats at one time! For a tree that only grows to be about 35 feet tall, that’s a lot of goats! Goats also damage Argan trees as they climb them in their quest for lunch. In the past, the pits from the goat’s droppings were cracked open and the kernels inside were pressed to make Argan Oil. The argan oil producers would then take the droppings of the goats, which had the seed completely undigested, and use that to produce the argan oil. While we’re sure that is still practiced today, some argan oil producers today are producing the oil, goat-free. The journey through the digestive system of a goat is not a necessary step in the process of making quality Argan Oil. Argan Oil is the best beauty ingredient. Here are some easy ways to include argan oil in your beauty regimen. Scalp: If you’re dealing with dry scalp, apply some argan oil to a cotton ball and dab your scalp with the oil. If you do this before bed, you’ll give the oil plenty of time to moisturize your scalp before you wash your hair in the morning. Face: It might seem scary to apply a pure oil to your face, especially if you have sensitive skin, but it will become smooth, clear and radiant, all thanks to using argan oil as your daily morning moisturizer. Hands: Argan oil is a great oil to use on your hands, especially on your cuticles and on your nails, if they are prone to cracking and peeling. Argan Oil is made up of unsaturated fatty acids, Vitamin E/tocopherols, squalene and sterols. Each of these components is unique and useful for different reasons. Some act as antioxidants, while others help with chronic inflammation. Some properties are even known for their ability to protect against skin cancer and for being anti-tumorigenic. Categories: Beauty, Did You Know?, Eat Green, Live Green, Natural Mantra, Organic Living, Sustainable Living | Tags: Argan Oil, beauty, Beauty Fix, face, Face Oil, Goats., hair, Hands, Morocco, Natural Mantra, skin | Permalink. What is the Pineal Gland and how does it activate our third eye awareness? What is the Pineal Gland, you might wonder? The pineal gland (also called the pineal body, epiphysis cerebra, epiphysis, conarium or the third eye) is a small endocrine gland in the vertebrate brain. It produces the serotonin derivative melatonin, a hormone that affects the modulation of wake/sleep patterns and seasonal functions. Its shape resembles a tiny pine cone (hence its name), and it is located near the centre of the brain, between the two hemispheres, tucked in a groove where the two rounded thalamic bodies join. 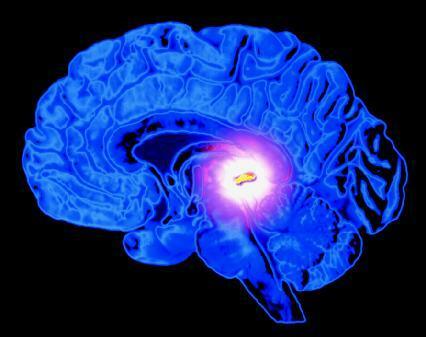 The pineal gland is activated by light, and it controls the various bio-rhythms of the body. It works in harmony with the hypothalamus gland which directs the body’s thirst, hunger, sexual desire and the biological clock that determines our aging process. When it awakens, one feels a pressure at the base of the brain. While the physiological function of the pineal gland has been unknown until recent times, mystical traditions have long known this area in the middle of the brain to be the connecting link between the physical and spiritual worlds. Many have said that awakening the third eye acts as a “stargate”. The pineal gland is seen as a gateway that leads to inner realms and spaces of higher consciousness. Most people’s pineal glands are heavily calcified by the time they are 17 years old, so much so that they show up as a lump of calcium during an MRI. Calcification is the build up of calcium phosphate crystals in various parts of the body. The pineal gland begins to calcify due to the harmful effects of artificial substances such as flouride chemicals found in public water systems and toothpaste, hormones and additives put into processed foods and sugars and artificial sweeteners dumped into soft drinks. Cell phones are also being pinpointed as being harmful to the pineal gland due to high concentrations of radiation. 1. Avoid all things fluoride: Tap water, cooking with tap water, fluoridated toothpaste, inorganic fruits and vegetables, showers without filter, red meat, and any sodas and artificial food and drinks. It is difficult to stick to only organic fruits and vegetables, but it is important to start where you are and begin to make those changes where it is possible. 2. Pineal gland detoxifiers and stimulants: Hydrilla Verticillata, Chlorella, Spirulina, blue-green algae, Iodine, Zeolite, ginseng, borax, D3, Bentonite clay, chlorophyll, blue skate liver oil. 3. Foods: Raw cacao, goji berries, cilantro, watermelon, bananas, Honey, Coconut Oil, hemp seeds, seaweed, and noni juice. 4. Essentials Oils can be used to help stimulate the Pineal Gland and facilitate states of higher awareness including meditation, astral projection, etc. Good essential oils for Pineal Gland purposes include: Lavender, Sandalwood, Frankincense, Parsley, Davana, Pine, Pink Lotus, and Mugwort (excess use of Mugwort has a neurotoxin effect if inhaled directly, so be careful!). Essential oils can be smelled, burned in a diffuser or nebulizer, and added to bath water. 5. Citric acid: Lots of lemons work. 6. Garlic: Take about half a bulb a day or more for a while, if you crush it and soak in raw apple cider vinegar or fresh lemon juice, it will deodorize it. You can use the leftover vinegar or lemon juice on a salad. 7. Raw apple cider vinegar: Contains malice acid. Take a lot of it. Make sure it’s raw, as that is very important. 8. Sungazing: Gazing at the sun during the first 15 minutes of sunrise and last 15 minutes of sunset will do wonders for your pineal gland. 9. Regular Meditation and Chanting: Chanting causes the tetrahedron bone in the nose to resonate and this resonance causes the Pineal Gland to be stimulated and when it is stimulated it secretes more beneficial hormones, and remember: these beneficial hormones keep your appearance youthful. 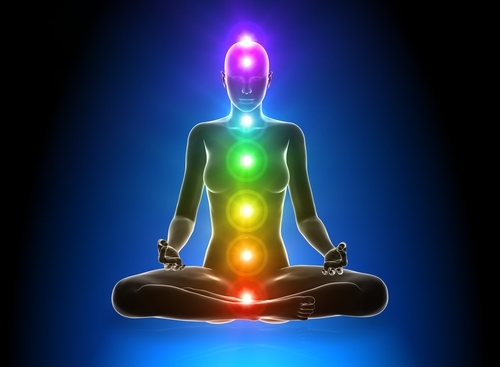 The sound “OM” resonates with the Fourth Chakra, known as the Heart Center. Chanting OM opens you up to a more universal and united awareness. You can chant 5 minutes, 10 minutes, or however long you desire to. 10. Crystals that benefit the Pineal Gland include: Amethyst (wand), Laser Quartz (wand), Moonstone, Pietersite, Purple Sapphire, Purple Violet Tourmaline, Rhodonite, Rose Aura, and Sodalite. However, any indigo, violet, or dark purple gemstone or crystal can be used to stimulate the Pineal Gland and open/balance/align the 6th and 7th Chakras. Placed directly on the 3rd eye or brow chakra for 15-30 minutes a day or every other day will help to open/balance/align the 3rd Eye (Brow) chakra. The best exercise for Pineal Gland stimulation and health is to take an amethyst obelisk crystal or an amethyst wand, point it at the 3rd eye (point of the wand should touch your skin) and look up directly at the Sun with your eyes closed. Do this everyday or whenever you feel like it for about 5-10 minutes. You can also use the Laser Quartz (wand) as well. Quartz crystal benefits every single chakra. Categories: Did You Know?, Eat Green, Eco Living, Live Green, Natural Mantra, Organic Living | Tags: Ageing, Biological Clock, Natural Mantra, Pineal Gland, Sexual Desire, Third Eye Awareness | Permalink. Is the “Brown Rice is better than White Rice” comparison a big, fat LIE? In our eternal quest for health, somewhere down the line, we started believing in the White Rice is bad, and Brown Rice is good competition via super markets and ads. We’re not sure who started this comparison, but there are many reasons it is not entirely true and may just be a big fat white lie, more than fact. The claim: White foods are bad for you. The truth: Many nutrition experts demonize white rice, potatoes, pasta, white bread, etc. because it’s an easy rule to remember and grasp, but these foods are really only a problem if you overeat them, which usually happens when you slather them in salty, fatty, sugary sauces, also making them a vehicle for salt, sugar, and fat. The claim: Brown rice is higher in fiber (one cup of cooked brown rice packs about three grams of fiber, while white contains only .5 grams), so it will keep you feeling full longer. 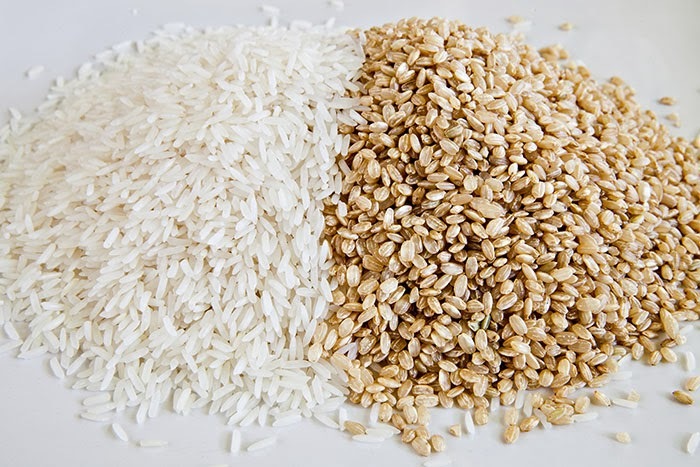 The truth: If rice were the only thing being consumed at a meal, brown rice would likely take a bit longer to digest, and hence, someone would probably be more satiated after eating it. Satiety is governed by the components of an entire meal, though, so if someone was having curry lentils, veggies, and a side of white rice instead of brown, it probably wouldn’t make much of a difference. The claim: Brown rice is less processed than white and is therefore healthier. The truth: Usually the more unprocessed a food, the better, because it contains more nutrients, but in this case the unprocessed component of the brown-rice grain contains both nutrients (good things for us to consume) and some anti nutrients (maybe not a good thing for us to consume), which are what the plant uses as a defense system against pests. The claim: White rice is packed with empty calories. The bottom line is that you can’t really go wrong either way. Alternating grains each time you eat a meal is a good way to maintain balance. Categories: Natural Mantra | Tags: Brown Rice, Healthy Carbohydrates, Natural Mantra, Polished Rice, Rice | Permalink.